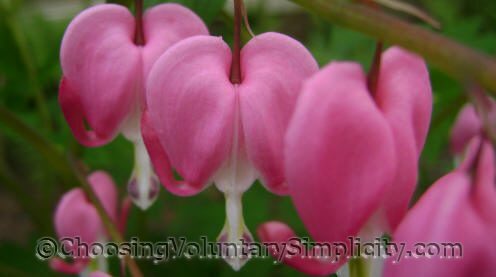 Bleeding hearts (Dicentra spectabilis) have arching foliage and drooping, heart-shaped flowers, and once mature can reach a height of about two feet. They flower in spring, produce seed pods, and then have a dormancy period. The plant’s common name comes from the unique shape of its flowers… they look like a heart with a drop of blood at the tip. 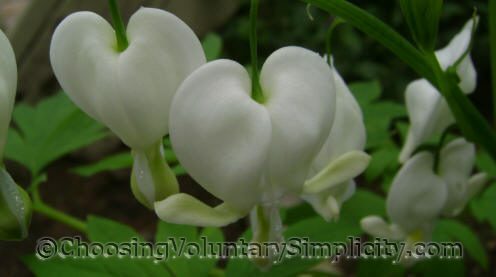 Other names for bleeding heart are lyre flower and Venus’s car. If I don’t remove the seed pods (and believe me, I try to get them all! ), I find groups of baby plants growing around the parent plant the next year. Bleeding heart can also be propagated by division. As beautiful as they are, I have to categorize bleeding heart (Dicentra spectabilis) as very invasive because every year I have dozens of uninvited small new seedlings to find a home for, and this is such a beautiful plant, how can I not find it another place to grow? You can see my problem! Energy Conservation & Convenience — A Trade-Off? I am so envious that you have *too many* bleeding hearts seedlings. I have such trouble getting my *one* bleeding heart to live I can’t even imagine what it would be like to have too many of them. I think they’re just beautiful. 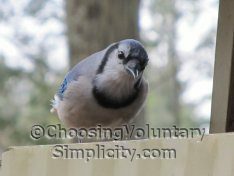 I appreciate your lovely photographs and great information. Those flowers are so beautiful. How fantastic that they are shaped like a little heart. I have never seen one but would like to grow this. I want to say thank you for your post on the bleeding heart plant, especially the one with the pictures showing what bleeding hearts look like when they first come up in the spring. If I had not seen that post I would have pulled up my bleeding hearts because they look so different than they do later on. So you’re the reason I had beautiful blooming bleeding hearts this year. Left to my own devices I would have ruined them.